Southwest will reportedly cut almost 200 flights early next year, according to the Wall Street Journal. The airline had previously suggested it would grow at a modest pace in 2009, so these capacity cuts come as a bit of a surprise. The changes will take effect January 11, and represent a 6 percent reduction of the airline’s schedule. Details of the affected routes are only just trickling out. Meanwhile, Midwest will be adding 11 seats to its Boeing 717 planes, a move the airline is trying to sell as a good thing for passengers. The airline is adopting a seating layout similar to JetBlue, where several rows have seats with extra legroom (called Signature seats) available for a fee between $25 and $75. Of course, you can’t add seats and legroom without reducing space elsewhere. The Milwaukee Journal Sentinel reports Midwest will compensate by making its regular seats narrower by three and a half inches, thus allowing more seats to be crammed onto the plane. It’s not surprising to see Midwest searching for new revenue streams, given the airline’s ongoing effort to avoid Chapter 11 bankruptcy, but it is unexpected to see Southwest trimming its budget. The airline is among the most fiscally strong in the industry, and as I mentioned above, Southwest was planning to grow in the coming year. Is this cause for concern? Probably not. CEO Gary Kelly says the airline still plans to add 14 new planes next year, and spokesperson Chris Mainz said the cuts are in response to a predicted slow travel period, as opposed to a serious financial problem. Some of the eliminated routes could even be returned to service later in 2009. 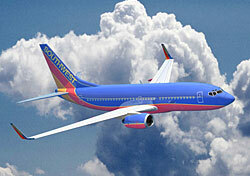 Still, if jet fuel remains expensive, even mighty Southwest will have to be cautious. As for Midwest, well, the airline is simply trying to keep its head above water.